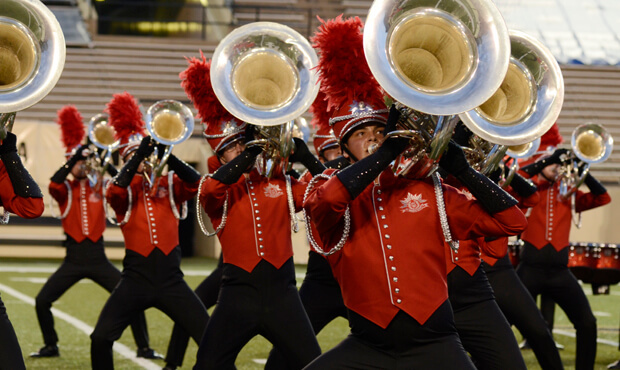 On Friday, July 25, eight of Drum Corps International's top World Class corps, along with one local Open Class corps, marched through the heart of Tennessee for the Masters of the Summer Music Games in Nashville. 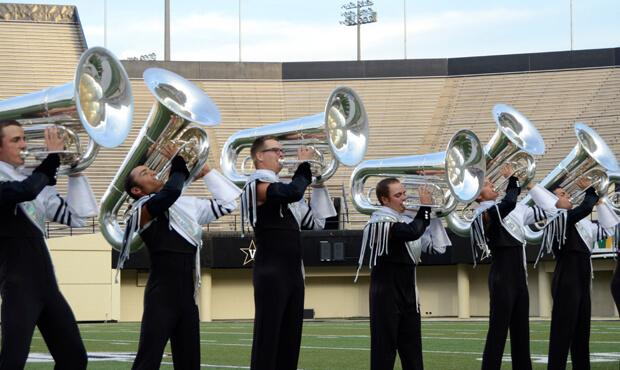 The event, presented by Jupiter, Mapex and Majestic, drew a crowd of more than 11,000 people to Vanderbilt Stadium for the fourth Tour of Champions (TOC) event of the summer. Debuting in 2011, the TOC brings an exciting nontraditional and experimental event format to the DCI Tour. With special pre-show and intermission entertainment, the TOC series is an engaging and interactive experience for the audience. But TOC shows aren't just fun for the audience. Aside from the added fan interaction, Cavaliers drum sergeant Travis Hattery has come to enjoy the random performance order used for the shows. "At first I didn't like it," said Hattery, "but it really is nice because you don't have to worry about who goes on before or after you. We can give our best performance early on and take the rest of the night to enjoy the show." On the competitive side of things, the Blue Devils once again took home first place with a score of 93.650. The corps from Concord delivered a loud, proud and in-your-face performance of "Felliniesque" that earned first place in the overall Visual, General Effect, and Music captions. The Cadets received second place with a score of 91.850 and the Bluecoats followed close behind in third place with a score of 91.500. 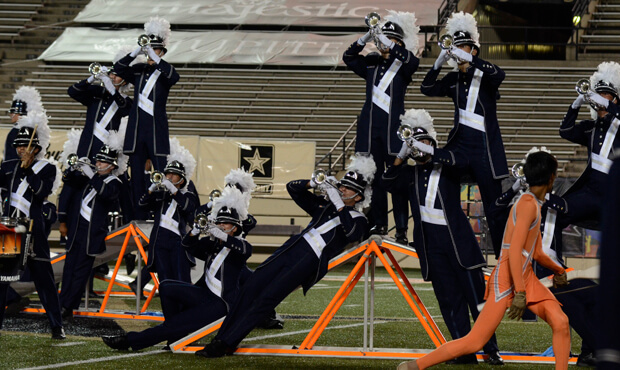 After an impressive showing in San Antonio and a few rehearsal days under their belt, Bluecoats drum major Willie Veenstra is proud of what his corps accomplished in Nashville. "We actually just added a new ending to the show a couple days ago, and it is incredible for us to perform it for the first time in front of a crowd like this," Veenstra said. Santa Clara Vanguard also spiced up the ending of its program with a new special effect to compliment the tag ending that was added while the corps was in Texas. SCV finished in fourth place with a score of 90.800. Carolina Crown grabbed fifth place with a score of 90.5, the Cavaliers came in sixth with an 86.8, Phantom Regiment took seventh with a score of 85.95 and the Boston Crusaders rounded out the World Class ensembles in eighth with a score of 83.650. Music City was the only performing Open Class corps, finishing with a score of 68.600. With the show taking place in Nashville, it was only fitting that the corps members were able to perform first and kick off a night of drum corps competition in their hometown. "I thought I would have been way more nervous, but I got in there and the crowd was really supportive and happy to see us," said second-year Music City euphonium player Aaron Gavin. "It was actually really exciting!" Tomorrow, everyone except Music City will travel south to Atlanta for the DCI Southeastern Championship at the Georgia Dome. They will be joined by the 14 corps that performed Friday in Huntsville, Alabama.